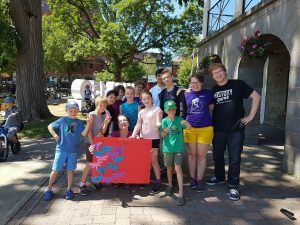 Summer employees Hannah and Zach (right) and former Executive Director Ruth Murgatroyd (centre holding poster) with students participating in summer camps during 2017. The Fredericton Region Museum has a limited number of summer student opportunities each year. As funding is dependent upon grants Young Canada Works, Community Museums Summer Employment Program and Canada Summer Jobs), interested students should research the youth employment programs and ensure that they qualify and, if applicable, are registered with the program candidate banks. Community Museums Summer Employment Program applications have an early deadline so please submit your application on time! Positions will be posted and interviews will be scheduled once funding commitments are received, send your resume and cover letter to the office addressed to the Executive Director. The summer student grant applications are usually completed by mid-February and the Fredericton Region Museum typically submits applications to three organizations each year. There is no guarantee that we will be receiving funding but if you are a student and interested in working at the museum then you should consider applying to the Young Canada Works website and the Canada Summer Jobs website which are both FEDERAL programs. The Community Museums Summer Employment Program is a PROVINCIAL program and does not require you to be registered. If any of the grants are approved then we will be updating the museum blog and posting it to Facebook so check back on a regular basis! We will not be approved fohttps://www.youngcanadaworks.car all grants so if you are interested in working at the Fredericton Region Museum during the summer then please apply for more than one position. You may also want to apply to the Sports Hall of Fame, Beaverbrook Art Gallery, School Days Museum, Science East and the Provincial Archives of New Brunswick. Each of these institutions will provide you with work experience in heritage and/or the museum industry. Co-op placements (High school only) are available. Academic coordinators please contact the office. The Fredericton Region Museum has a limited number of job opportunities each year as funding is dependent upon grants. Job advertisements are posted as the need arises. Resumes received after a stipulated competition end date will not be considered. Apply in person to the Executive Director at 571 Queen Street with a resume and cover letter during regular business hours. All permanent and long-term positions, whether full- or part-time, are hired through a competitive process. Job ads for open competitions at the Fredericton Region Museum are posted on this and other sites and sometimes the Daily Gleaner. No phone calls please. It is preferred that applications are dropped off in person since we sometimes do a pre-interviews on the spot if time permits. Only candidates selected for interviews will be contacted. Co-op placements (High school only) are available. Academic coordinators please contact the museum office. The Fredericton Region Museum has a very limited number of job opportunities each year as funding is dependent upon grants. Job advertisements are posted as the need arises. Resumes received after a stipulated competition end date will not be considered. APPLY IN PERSON to the Executive Director at 571 Queen Street with a resume and cover letter during regular business hours. Click here to see hours of operation. NO PHONE CALLS PLEASE. General Resumes can be sent to the office and will be kept on file for a period of six months.